A LEGO® Wiki that anyone can edit! 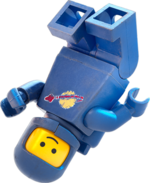 Benny, also referred to as 1980-Something Space-Guy, is a supporting character in The LEGO Movie voiced by Charlie Day. Benny makes two appearances in the toyline based on the film. The character's inclusion and design are influenced heavily by the Blue Classic Spaceman from the 1980's. In fact, Benny's inclusion in the film is because co-director Chris Miller requested that a character from the Classic Space era appear in a large role because of his nostalgia for the theme. LEGO CUUSOO (now LEGO Ideas) was opened to a worldwide audience after originally being available only in Japan. Double VIP Points on 76126 Avengers Ultimate Quinjet and 76131 Avengers Compound Battle. Congratulations from all of us here at Brickipedia! Want to add your site or organisation? This page was last edited on 1 December 2018, at 04:44.